Last night, some of us reconvened for our first rehearsal after the Christmas break - members of my immediate family within the context of Hometown...The Musical! : my daughter, son-in-law and grandchildren. As the "man as old as the hills", my character - Grandpa George - acts as the conduit to our community's incredible history, sharing a couple of interesting anecdotes going as far back as 1778. After going through the scene that touches on Peter Pond opening up the Athabasca River basin on behalf of North West Company, I couldn't help but share a little additional history. "Did you know that the river that flows through Fort McMurray was the only way to travel from east to west for about 75 years," I said. "It was like the Trans-Canada Highway of its time." I think it's important for those of us who are somewhat familiar with the interesting factoids of our past to find ways of sharing them. It often surprises me how information that I take completely for granted is new, even for people who have lived here for years. Hometown will playfully expose some the rich stories that have come out of this region and hopefully, share them with a whole new audience. Thankfully, we have a number of excellent local history books, should Hometown whet the appetite for discovering more about our past. The Place We Call Home by Irwin Huberman and More than Oil by Frances Jean are two examples that are readily available at local stores, both of which are excellent reads and tremendous sources of local lore. The soundtrack to Hometown rattled through my brain and throughout our house over the holidays. "Fix You" by Coldplay, unknown to me before this process began, now seems like it has been with us for a lifetime. "I can't get that song out of my head," said my 9-year old son Ben, as the haunting sounds of the organ at the top of song emanated from the speakers for yet another play. My three-year old niece was captivated by "I Wanna Be Sedated" by The Ramones and kept repeating the chorus during one of the days of our visit over Christmas. If we do this right, the songs that underscore this story of us, will be hummed by the several thousand residents who will see the show in February. My hope would also be that more than several people leave the theatre talking about some of the historical nuggets that will be unearthed. The entire ensemble convenes tonight for a workshop as we begin the frenetic part of the journey to Hometown, with the opening night of February 15th within our sights. 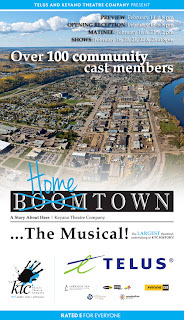 Hometown...The Musical! is written, co-created and directed by Michael Beamish and Claude Giroux. 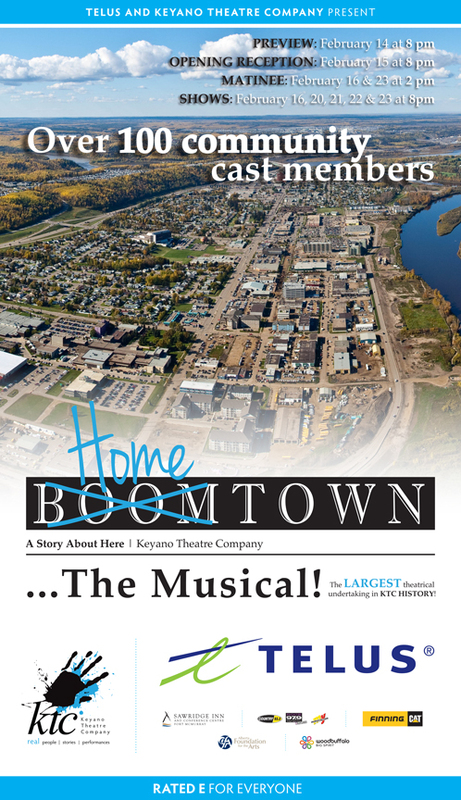 It opens February 15 as part of the Keyano Theatre Company TELUS Drama Series.